In September, Screen Rant reported the somewhat baffling news that Stephen Chow (Shaolin Soccer, Kung Fu Hustle) would be playing a major part in the production of the Green Hornet film. We already knew Seth Rogan was attached as the lead and the good news was that Chow would be playing his crime-fighting sidekick, Kato. The not-so-exciting news was that Chow would also be directing the film. With Chow directing, this film would be a “laugh-riot comedy” as Screen Rant master Vic pointed out. Although Chow's previous films were great comedies, that style didn’t seem to fit what the original thirties radio show or sixties TV series were all about. At the time of the announcement, most of the people behind this movie had backgrounds in writing, acting and directing comedies so it was pretty clear where the new direction of the project was heading – a far different direction than that of the original series. Well, now this might be changing. Thursday evening, news popped up announcing that Stephen Chow has stepped out of the director role over “creative differences.” He is however still playing Kato, which is good news. Hmm… I wonder what these creative differences could be about. Did he want comedy and they didn’t… or vice versa? I for one am happy he won’t be directing but I'm even happier that he’s still involved, playing one of the lead roles. Despite what I've said about comedy in this film, I'm a big fan of Chow's movies. Green Hornet might have been great as an all-out comedy (and with Seth Rogen involved, it may still be), it's just not what I'd prefer to see. What do you think? Should this be more on the serious side or more of a just-for-laughs gig? Producer Neal Moritz is currently searching for the new director in hopes for a Spring start in production. 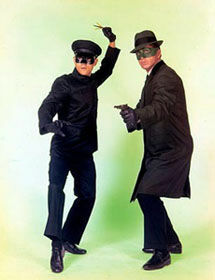 Green Hornet is planned to hit theatres June 25, 2010.